A picture is worth a thousand words . . . It's a lot easier to show somebody how to install a maintenance kit than to tell them. After talking with hundreds of customers over the phone about installing printer maintenance kits, we decided to write our own manuals. 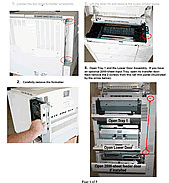 The instructions we found from Hewlett Packard and other sources were missing lots of information and often didn't contain any pictures. So here you are! We hope you find the installation instructions helpful. A lot of time went into creating them, feel free to email us with your comments! Select your HP LaserJet model from the list below.